Carrying on from yesterday’s post in the Tarot Challenge, we encounter the second question in the list: What was your first deck and why/how did you get it? I answered that yesterday, with explaining how I’d come into the Tarot. So I shan’t tell you it again. What I shall do is share with you how I got the second deck I ever owned. Remember, I married in 2002, so this happens 3 years later. It is the Gilded Tarot by Ciro Marchetti. I was at the TABI Tarot Conference in 2005 and I met a lot of people I’d discussed the Tarot with on-line. One of these ladies was Rashunda Tramble. She’d been given the mass-produced Gilded Tarot, but didn’t like it. She wanted to do a swap, but I had nothing to swap it with. She kindly gave me a list of decks she would like, so off I trotted to Zen, who at the time were in Brindley Place, bought her a copy of one she wanted and came home. One bomb scare and a day later, we swapped and I was the very happy owner of my second Tarot deck. 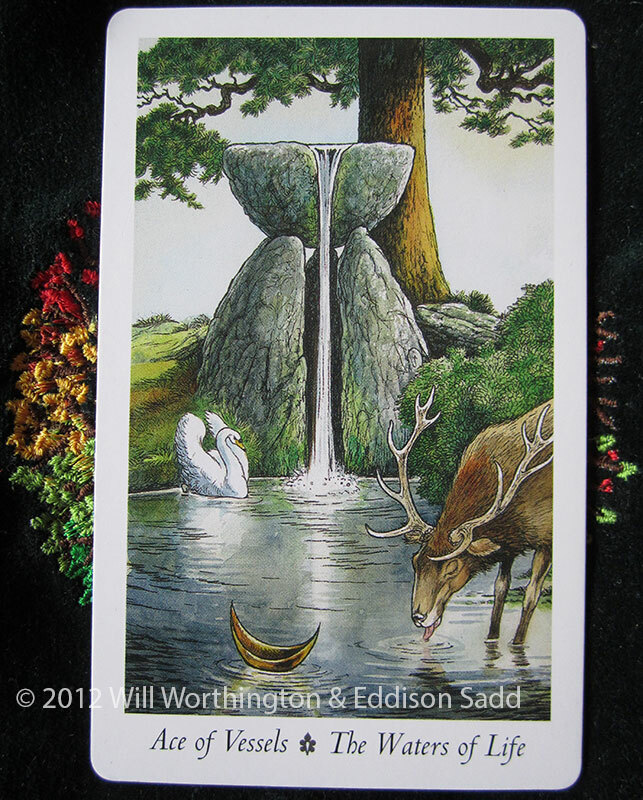 I was still using my RWS, for the TABI Tarot Course, but the images spoke to me more than the RWS did. The Gilded is not my only “working” deck and with purchasing / acquiring it, my collecting spree began. I also purchased the Tiny RWS, a deck of 78 cards no more than an inch tall and three-quarter inch across. It’s tiny, like its name and it’s perfect for using in small spaces, like train tables or your lap with a large book. It lives in my hand-bag, with a few others! 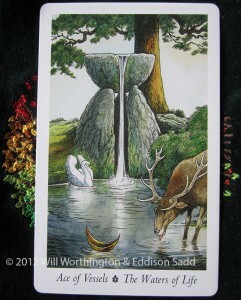 What does the Ace of Cups mean to you? I picked this card out of The Gilded because of its meaning. To me, this is the start of new emotions, of a new way of feeling. It’s time to start again, to replenish your emotional self and if necessary, take a step back from the water’s edge to find a way to drink from the fountain of life, without getting swept away. There are other questions to the 30 Day Tarot Challenge: I hope you have enjoyed today’s entry and insights. I like to receive your feedback and comments, so please do comment but if you’d like a personal reading of your own, you can do that via this page.